Includes one better bargain beehive wig. The wig features elastic band for a comfortable and secure fit to almost any head size. 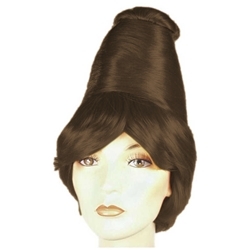 Beehive wigs are perfect for a number of different shows including Grease or The Little Shop of Horrors. These wigs are also a fun oversize wig for Halloween or masquerade costume parties. This wig is a high quality wig at an affordable and works perfectly for school projects and reports, historical costumes, or theatrical performances on a budget.